KALISPELL, MT –January 5, 2017 – The Flathead Community of Resource Educators (CORE), a network of individuals and organizations working together to increase awareness and understanding about the natural, historical and cultural resources of the Flathead Region, is celebrating Winter Trails Day on Saturday, January 14 with several free outdoor activities. These free activities are a great way to enjoy the outdoors in winter and discover the fitness and social benefits of snowshoeing and winter hiking in Northwest Montana. All activities are suitable for beginners and families. Be prepared with warm clothing and wear sturdy hiking shoes or boots. Bring along binoculars for catching a glimpse of winter birds. 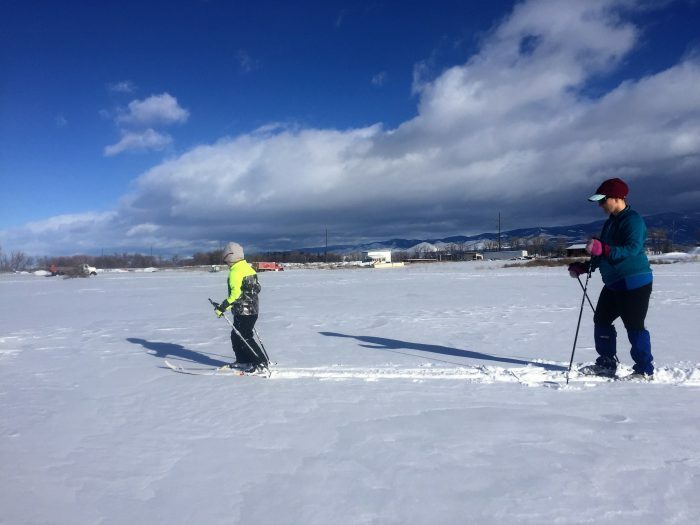 Ø A snowshoe walk on the Flathead National Forest, hosted by the Swan Lake Ranger District and Foys to Blacktail Trails, will be at the Blacktail Mountain cross-country ski trails near Lakeside, 10am-Noon. Participants may bring snowshoes, or a limited number of children and adult shoes will be available by reservation. Please meet at the upper trailhead parking area. Reservations are not required. For more information or to reserve snowshoes, please contact the Swan Lake Ranger District at 837-7500. Ø Explore Lone Pine State Park on snowshoes. From 10am to 5pm, park visitors can borrow snowshoes and explore the many park trails. Adult and children’s snowshoes are available on a first-come, first-served basis. A ranger-led snowshoe walk takes place at 1pm. Please contact the park at 755-2706 for more information and to reserve snowshoes for the 1pm walk. Ø Ranger-led snowshoe hikes at Glacier National Park will be hosted at 10:30am and 2pm. Each hike will last approximately two hours and reservations are not required. Snowshoes are available for hike participants. Visitors need to purchase a park entrance pass. Please meet at the Apgar Visitor Center. Call 888-7800 for more information. Ø Join Flathead Audubon for a guided ‘Winter Birds and Tracks’ hike along the trails at the Owen Sowerwine Natural Area in Kalispell, from 10am to Noon. Bring your snowshoes. Meet at the Treasure Lane entrance gate (at end of Treasure Lane off Willow Glen). Call 249-3987 for more information and to register. For more information about the above local events visit, http://flatheadcore.org/. During the month of January there are several other opportunities to get outdoors and enjoy winter trails, including another Winter Walk with the Montana Wilderness Association on January 21 (http://wildmontana.org) and a guided snow science walk hosted by Whitefish Legacy Partners along the Whitefish Trail, January 22, (call 862-3880 for more information).